A kidney transplant is a fairly common surgical procedure that is performed to place a kidney from a live or deceased donor into a person whose kidneys no longer function properly. Kidneys filter out blood and wastes in the body and when they cease to function properly due to disease, they must be replaced. The human body can function adequately with only one kidney so a donor can donate a kidney to the patient. There are a few problems that can arise as a result of the transplantation process. However, many of these complications have to do with the immune suppressant medications the patient is required to take to prevent the body from rejecting the life-saving organ. Kidney transplants save many lives. The first successful kidney transplant took place at the Peter Bent Brigham Hospital in Boston. The procedure was performed by Dr. Joseph Murray, on identical twins, Richard and Ronald Herrick. Ronald donated the kidney to his brother who was dying of kidney disease. The very first kidney transplant, however, was performed on a dog in 1902, in Vienna. The kidney was transplanted from one dog into the other dog's neck. The credit for this amazing medical feat goes to an Austro-Hungarian surgeon Emerich Ullmann. The transplanted organ lasted for five days. The same surgeon also attempted to transplant between a goat and a dog, and later, between a pig and a human. Both of these attempts proved unsuccessful and he stopped his work regarding transplants. In 1902 a French surgeon named Alexis Carrel also discovered and developed vascular suture techniques that are still used today. He collaborated with Charles Guthrie, an American physiologist at the University of Chicago. He also published 33 papers on subjects that are still considered the basics in modern transplanting. He later received a Nobel Prize in 1912. Prior to this, the first human to human kidney transplant occurred in a series of allografts from 1933-1949. 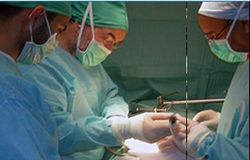 In this series, the kidneys were transplanted into the thigh. The patient who received the kidney was a woman in her mid-twenties who was in a uraemic coma due to a failed suicide attempt. The donor of the kidney was a 60 year old man who died from a skull fracture. Although the transplant was considered successful, the recipient died two days later with no urine production. All six of the transplants in this series performed by Yuri Yurijevich Voronoy ended similarly. At the Peter Bent Brigham Hospital in Boston, Charles Hufnagel (staff surgeon), Ernest Landsteiner (chief resident in urology) and David Hume (assistant surgical resident) are credited with pioneering and performing the first successful kidney transplant. Kidneys affected with polycystic kidney disease which causes 10% of end stage renal disease. The need for a kidney transplant can arise from many complications. There is two types of kidney failure. One called acute kidney failure which happens quickly as a result of a sudden, short-termed illness or condition. damage to the kidney can be reversed completely and failure avoided if the condition causing the failure is resolved. Chronic kidney failure happens over a long period of time and is often the result of a long-term chronic illness/disease. Many conditions are directly related to causing the patient to develop kidney failure. These disease include; diabetes (type 1 and 2), high blood pressure, glomerular diseases, hemolytic uremic syndrome, sickle cell anemia, sever injuries and burns, major surgeries, Heart attack and heart disease, liver disease and failure, inherited kidney diseases, and vascular disease. In addition to these, taking antibiotics or cyclosporin, abusing heroin, and chemotherapy cause inflammation of the kidney and can result in failure. Gout, certain cancers, HIV, rheumatoid arthritis and graft failure for a past kidney transplant are also causes. Many complications can arise with any kind of surgery, including kidney transplants. After surgery, the new, transplanted kidney may be rejected by the patient. In this case the persons own immune system can attack and destroy the organ. There are a few symptoms that warn of this complication. Hypertension, high blood pressure is a sign that the new kidney is not functioning as it should. Other signs include, fluid retention, often in the legs, arms, and face. The patient can also experience shortness of breath due to fluid retention in the lungs. Rejection can be treated with medication if it is identified early. A patient can also have blood clots, and bleeding, leaking or blocked ureter. Even though the donor kidney is screened for diseases before the transplant, the recipient has a risk of contracting infections or certain types of cancer form the donor kidney that did not show up in the screening results. The medication used to help suppress the immune system can increase the patient's risk for infection. In addition to this, the transplanted kidney may be slow to function, this is sometimes known as "sleepy kidney." It often takes a few weeks for the kidney to start functioning normally. Another risk involved in kidney transplant is high blood pressure. Most of the problems with blood pressure are also caused by the immunosupressant medications and can be controlled by additional medications for blood pressure. The immunosupressants may also cause the patient to develop diabetes. Symptoms of this include dizziness, thirst, blurry vision, drowsiness, confusion, and frequent urination. Sometimes, lymph fluid can build up around the kidney. This is a common occurrence post-transplant, however, an exceptionally large buildup can cause pressure on the kidney, inhibiting its ability to drain urine. This buildup is called a lymphocele and must be drained either surgically or through a tube over the course of a few days. ↑ . History of Transplants National Kidney Center.org. Web. Accessed April 20, 2016. Author unknown. ↑ . History Of Renal Transplant Renal Med. Web. Updated April 13, 2016. Author unknown. ↑ . Kidney Transplant mayoclinic.org. Web. Accessed May 7, 2016. Author unknown. ↑ 4.0 4.1 . 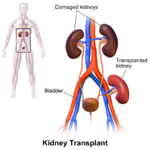 Possible Kidney Transplant Complications Emory Healthcare.org. Web. Accessed 6 May, 2016. Author unknown. ↑ 5.0 5.1 .Kidney Transplant (cont.) Emedicinehealth.com. Web. Updated April 21,2016. Author unknown. This page was last modified on 28 May 2016, at 21:25.